The theatre and film director Richard Eyre discusses Shakespeare’s History plays, and their role in our understanding of Britain’s identity. “I’m going to free associate” he begins “rather than give an organised lecture”. He’s a big fan of Henry IV Parts I and II but King Lear is his favourite because it’s the story of fatherhood. Goethe said “every father is in some sense a King Lear”. The relationships between fathers and their offspring are invariably central to Shakespeare’s history plays. Eyre talks about his own Dorset upbringing where there was little artistic stimulation. The nearest cinema was 12 miles away and his own parents did not encourage him to read. Eyre’s free association moves on to the making of The Hollow Crown, the films he directed featuring Henry IV Parts I and II and executive produced for the BBC by Sam Mendes. 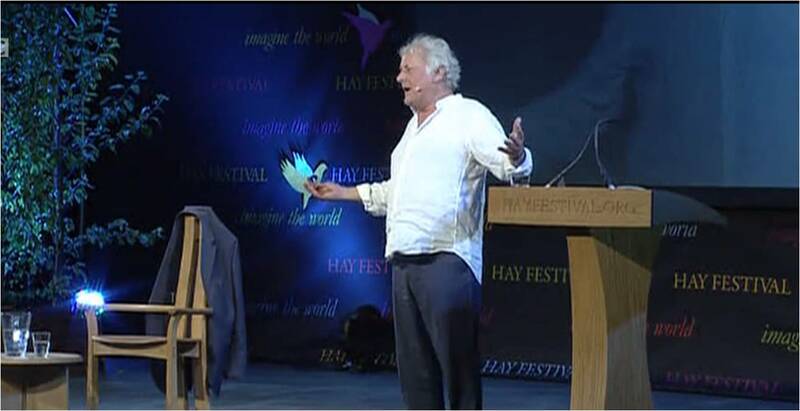 The audience at Hay was treated to a substantial excerpt. “I wanted to run at that length because it demonstrates a lot of things that are important in translating from the theatre to film” said Eyre. Part of the challenge is to honour the rythym and structure of the Shakespearian language with the more naturalistic requirements of film. Something that Eyre says requires great actors. “We had a cast that it’s inconceivable that you could have in the theatre…every actor that I asked to be in it said yes”.